Companions needing the most urgent care or who otherwise do not have sponsorships. We appreciate any donation, no matter how small. For donations larger than $25 USD, please contact us by email to make arrangements. Optionally a dedication can be attached to the donation. Dedications appear in our “Thank You” page. By clicking the Donate button, you will be redirected to PayPal’s Web site to complete the donation. You do not need a PayPal account to donate if paying by credit card or debit card. If you do not wish to donate through PayPal, you can mail your donations directly to KISS. See our Contact page for mailing information. If you are passionate about helping one of our companions that are currently active in our program please click here to earmark your donation for that special dog. 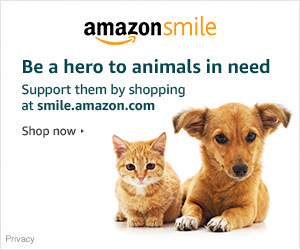 Amazon will donate a percent of the price of your eligible Amazon Smile purchases to K9s in need of Special Support whenever you shop on Amazon Smile. For more information please visit Amazon Smile. You can also shop through GOODSHOP.COM and the stores will donate a portion of your sale to KISS! This information can be found on the GOODSEARCH page. Please help us help them. Visit our Go Fund Me page K9’s in need of Special Support.